The child-like drawings Gonzalez uses to complement her text are anything but naïve. They colorfully and accessibly connect present political conditions under Trump to the US’s history of bullying, including abusing power to shore up strength through colonization, slavery, and land grabs. In her description of the bullying experienced by American Indians, Gonzalez illustrates colonization through a line drawing of a ship on top of a colorful sea full of life. On the facing page, mountains and watery waves frame a group of American Indians in traditional attire. Both images are framed as if they are pictures mounted on a wall. Historical atrocities are subtly connected to present day ones through the inclusion of an American Indian in a “Standing Rock” t-shirt looking at the image of her ancestors. Gonzalez also connects the past to the present in her discussion of African Americans. She notes that 12 out of 18 US presidents owned African people and connects this to the gross disregard of black lives in instances of police brutality occurring today. She does this by depicting an African American in a “Black Lives Matter” t-shirt. Gonzalez’s illustrations are beautiful and beautifully inclusive. For instance, in what I will refer to as a short vignette, “Doing keeps us strong,” Gonzalez depicts small and large groups of children identifying social issues, creating signs to protest injustice, and actively participating in protests. The cast of characters she illustrates include younger and older people, a girl wearing a hijab, and someone in a wheelchair. In this vignette, Gonzalez identifies a range of social justice issues that can prompt valuable discussion: immigrants’ rights, indigenous rights, disability rights, and economic justice are among them. There are many such vignettes that make it easy to move around the text in a non-linear way. Gonzalez also includes great activities to encourage self-reflection through drawing and writing. My favorite is her “Be Your Own Witness” activity. Gonzalez prompts children to identify words and names bullies have used to hurt them, narrate their reaction, and describe themselves positively. Doing this helps bullied children reclaim the narrative and tell their own story. Gonzalez has other free resources on her amazing website. In addition to great activity sheets, there’s a useful glossary and list of resources in the back of the book to help facilitate informed discussion about the issues presented. Politics affects the lives of children. I am not sure why this needs to be written, but I am sure it does. No child gets a childhood free from privilege and power. The idea that childhood is a space of innocence and that good adults protect children does not help them become intelligent justice-minded community members. Gonzalez provides tons of resources to help us do good by our kids. 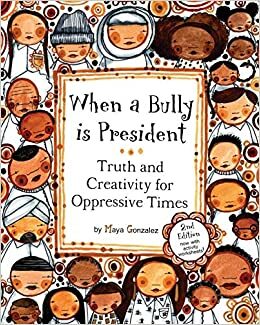 I highly recommend When a Bully is President: Truth and Creativity for Oppressive Times for classroom use as well as personal libraries. It is appropriate for children five and up. Even more, because of the activities and ideas expressed, I can see pre-teens enjoying this in their book collection. This is the best, most thorough, conversation starter about experiences of discrimination I have come across.